If we're off on a long journey, it's mandatory that I pack sausage rolls. Not any old shop-bought things. Even Morrisons ones won't do in this instance. I doubt the ones from Downs Bakery would even past muster on this occasion. They absolutely must be homemade ones. 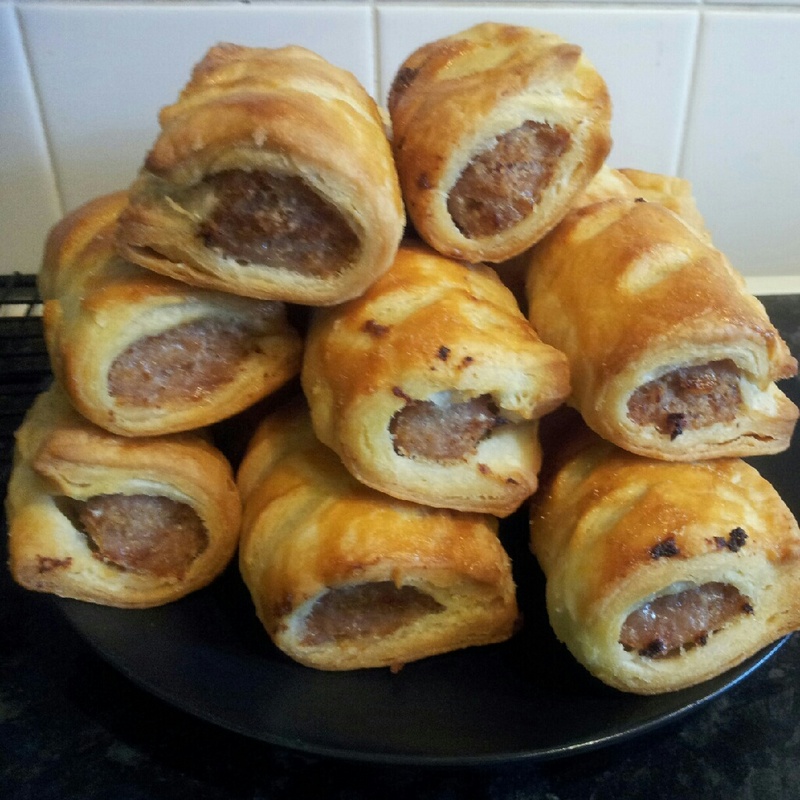 Made using JusRol regular puff pastry and sausage meat from Les Smith's butcher in my childhood village. I've tried subsitutions before - such as making them with The Black Farmer Sausages when I've not had time to go home before the trip. Despite those being the sausages of choice for every other sausage-related meal, they make an inferior sausage roll filling according to the husband. Likewise, I once tried JusRol All Butter Puff Pastry. There was too much butter and they were too greasy. Neither of these errors prevented the husband eating them all, but I learned not to do it again. Generally, the husband will have his usual breakfast before we leave. Normally this would sustain him until midday. But for some reason, if we have a long journey ahead, he automatically starts whining he's hungry before we've even hit the M4 (about six miles from our house) and the sausage rolls have been broken into before we've made it to the next junction. This year, I've decided to rock the boat again, all in the spirit of trying something new. So I've spent today making Dan Lepard's All Butter Puff Pastry. 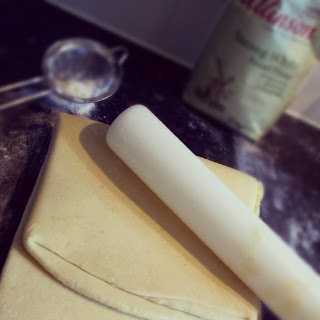 Having mastered both his Spelt Rough Puff Pastry and his laminated dough for Danish pastries earlier this year, I figured that proper puff was the last hurdle to pass before this year of blogging was out. I also took the opportunity to absorb all the good advice that he imparts in Short and Sweet to help make the pastry experience a happy one. The key point being that this is something that needs you to take a whole day to do. Which is why I began at 5.30am, allowing me time to do two turns before work at 7am. I eventually lost count of how many turns I did which reminded me about a lesson I should've learned from a blog post by my lovely Twitter pal Sadia about when she made this very pastry. Do have a look at the post. Her photography is stunning and she's got some good advice on the recipe. I was very wary that I've gotten a little cocky following Dan's recipes and didn't assume that this would work well (see my tale of pre-bake smugness before the disaster that was my attempt at Brown Sugar Chocolate Cake) but thankfully, for the sake of the sausage roll demands it did what it said in the book. The temperature of the pastry/butter is very important. I left my butter out overnight to soften. Normally when i do this, it's still pretty solid, and I end up having to soften it further in the microwave. But just to spite me, the butter was at the perfect consistency for cake making - not what I needed for pastry. I used some from the fridge to do the first step of rubbing fat into flour and then refrigerated the rest before the layering began. Thankfully my fridge has a super-chill setting for when you've been shopping so I stuck it on this for half an hour and it firmed up a little. Normally I'd use the freezer, but sometimes I've ended up getting distracted and thirty minutes in the freezer becomes two hours and suddenly I have frozen rather than firm. I think too cold butter was the problem that I had when I had my first attempt at making laminated Danish dough, using another recipe, just before Christmas. Call it a lesson learned. Once the layers start getting thinner, the butter has a tendency to escape so I found that strategic checking and re-flouring during rolling worked quite well. But you have to be careful not to over-flour or the layers won't stick together. Having snaffled one for taste-testing in advance of tomorrow's journey (with Miss A also being partial to sausage rolls, I probably won't even get one tomorrow), I am so pleased with them. The pastry is light, flaky and beautifully buttery. Obviously chock-full of calories, but hey we're on holiday. Diet definitely resumes in earnest in July. My only disappointment is that the pastry is a little lacking in salt. It probably could've done with another quarter teaspoon. Quarter of a teaspoon in a kilo of pastry isn't much. I think it's because the sausage meat is so savoury, the pastry tastes a little bland against it. Baked on its own though (I baked a scrap sprinkled with sugar and cinnamon) it tastes great. I won't be buying pre-made puff again. If you want to have a go yourself, you can find the recipe here, but I definitely recommend reading the good advice in Short and Sweet.